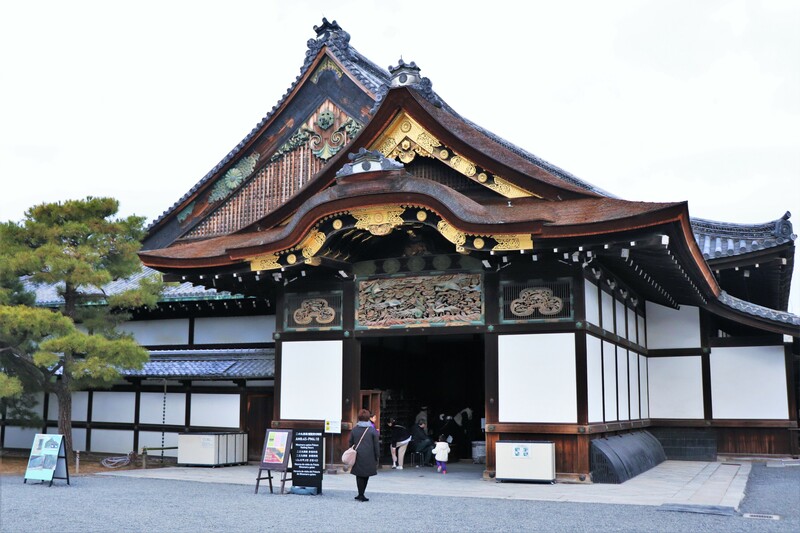 When it comes to the most popular tourist spot in Kyoto, Nijo Castle usually gets somewhere near the top of the list. 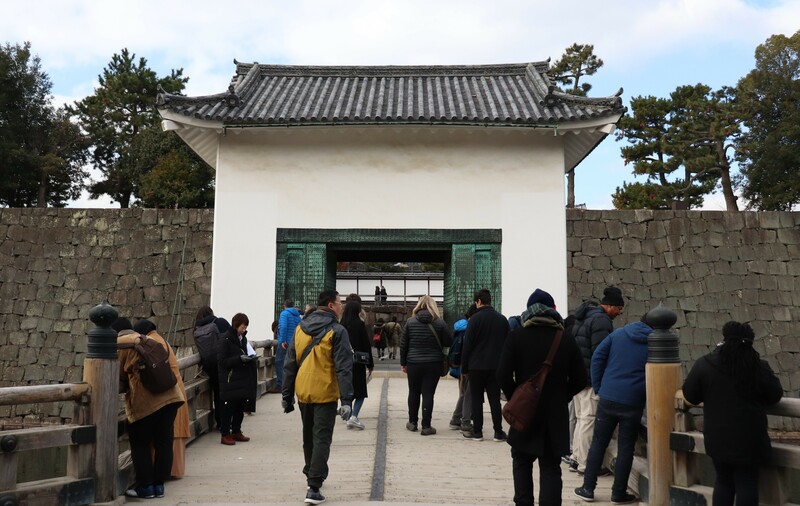 Not only is the castle located at the very center of Kyoto City and is very easy to find, but Nijo Castle saw both the rise and fall of the Tokugawa government. Tokugawa’s castle stands essentially intact over the centuries and ever since the reign of the Tokugawa clan it has greeted many visitors. 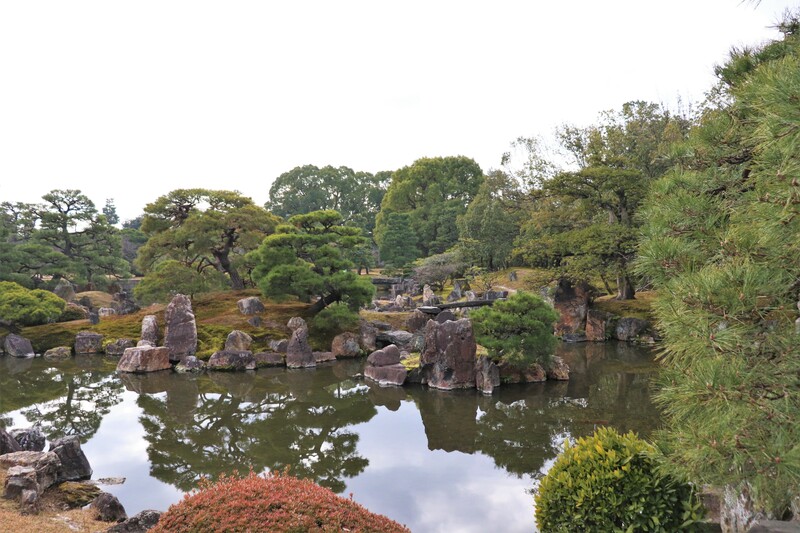 Nijo Castle is a gorgeous palace that witnessed the history of the Edo Period. Built in 1603 by Tokugawa Ieyasu Nijo Castle was the only palace in Kyoto for shoguns to stay when they came to Kyoto from Tokyo and to protect the Imperial Palace. He also used the castle as a ceremonial hall for the Tokugawa clan. It is also where Tokugawa Ieayasu received the title of shogun from the emperor, ergo beginning the Edo government, and also where he had a fateful meeting with Toyotomi Hideyoshi’s son, Hideyori, ultimately leading to the Siege of Osaka. Unfortunately, after a while the Tokugawa clan completely stopped visiting this castle simply because the capital was now Tokyo. 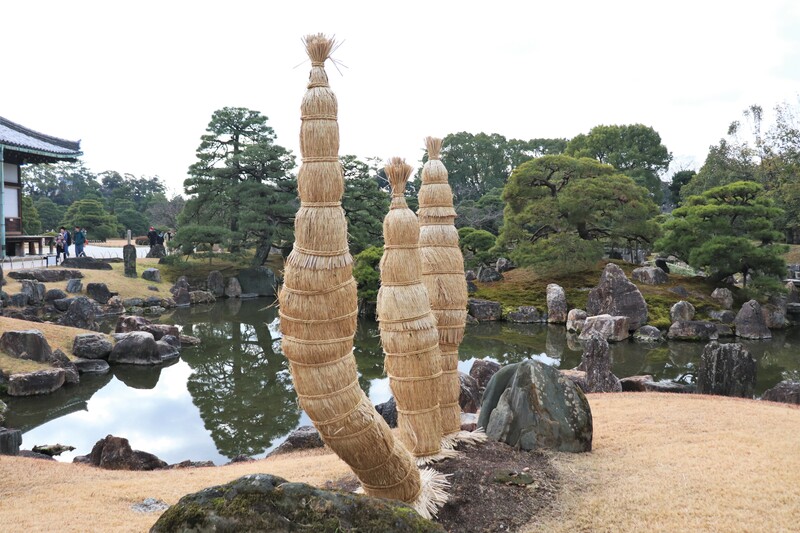 It was only at the end of the Edo Period during the collapse of the Tokugawa government that the Tokugawas returned to Nijo Castle. Finally in 1863, the last shogun, Tokugawa Yoshinobu, resigned and return all the authority of his position to the emperor in Nijo Castle, ending the era of the samurai once and for all. After the fall of the Tokugawa Nijo Castle passed to the imperial family and later the city of Kyoto obtained the castle. The easiest way to get to Nijo Castle is to take the subway. Take the Kyoto City Subway Tozai Line to the Nijojo-mae Station, which is right in front of Nijo Castle. You could alternatively take the JR Sagano Line to Nijo Station. 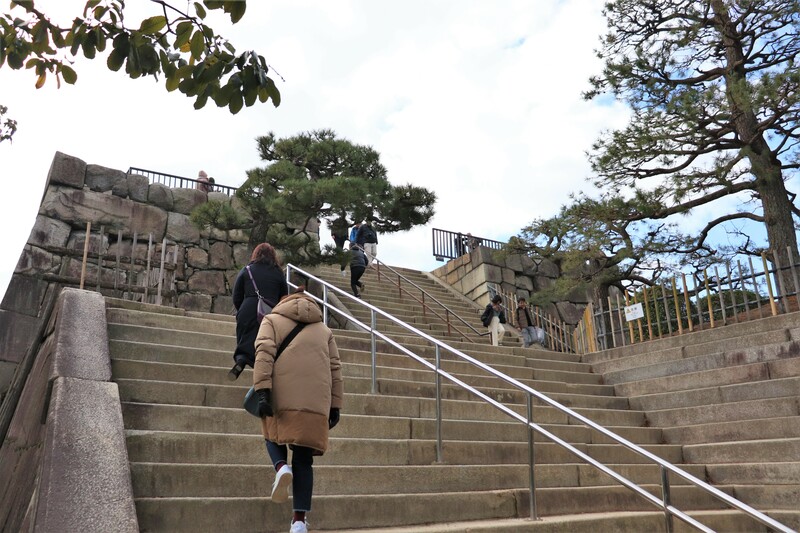 This route might be especially convenient especially if you are coming from Arashiyama; Nijo- Castle is just a 10 minute walk JR Nijo Station. 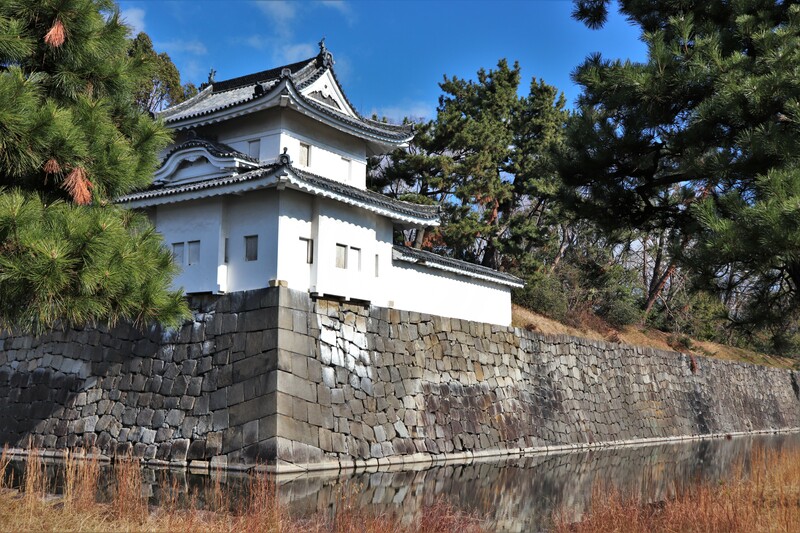 There are many bus services available to Nijo Castle, but the subway is probably much faster and more convenient, so we strongly recommend that you take subway. 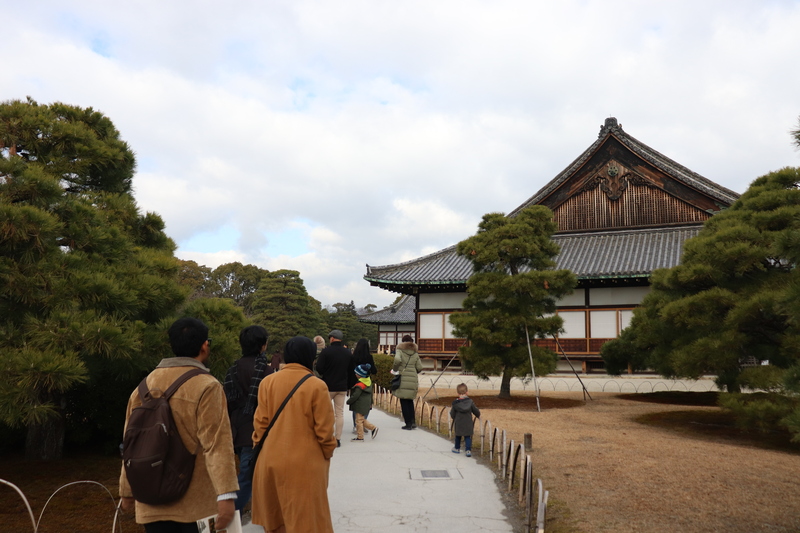 Though many people go straight into Ninomaru-goten Palace, but we recommend walking around the outside of castle grounds first. You can learn many things about the castle from its motes and stone walls. When people go castles, they often like to imagine how the castle’s defenses worked or to hear about any interesting battles that took place there. Nijo Castle on the other hand never saw any battles. Since Tokugawa built it just after he conquered Japan, he didn’t intent the castle to see any wars. This is why the mote is quite shallow, and castle walls, not that high. As you can see, the castle’s defenses are next to zero. Turret: there were turrets in all corners in Nijo-jo Castle but only two left. The current one is very original one since 1603. The main entrance to Nijo-jo Castle is Higashi Ote-mon Gate. 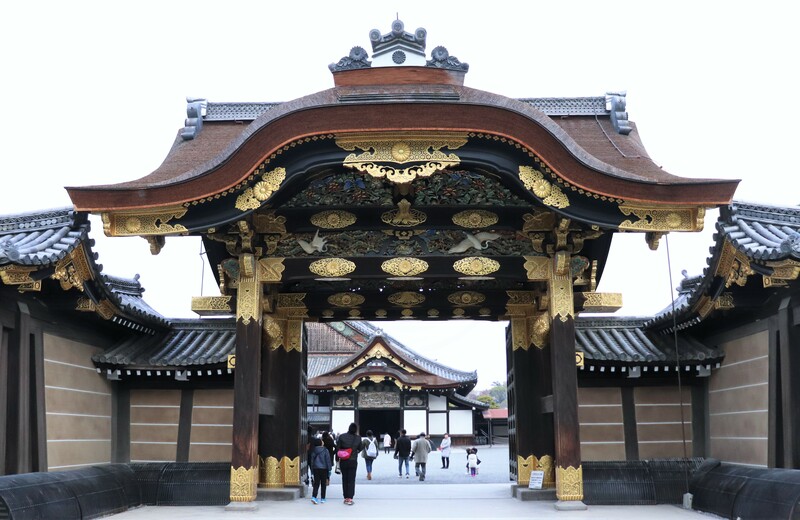 Once you pass through this gate, you will see the most iconic structure at Nijo Castle, Kara-mon Gate. Kara-mon Gate: A brilliant gate with detailed carvings. 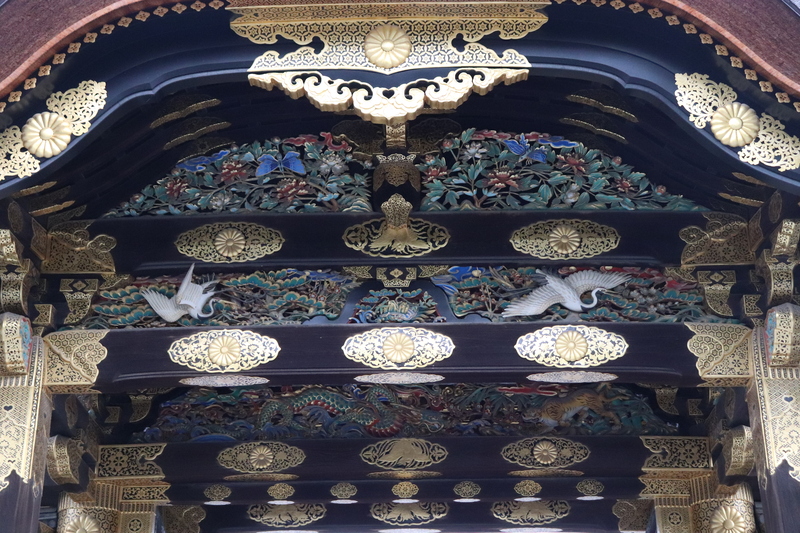 Carvings of Kara-mon Gate: The chrysanthemum crests are present because at one time the imperial family owned Nijo Castle. 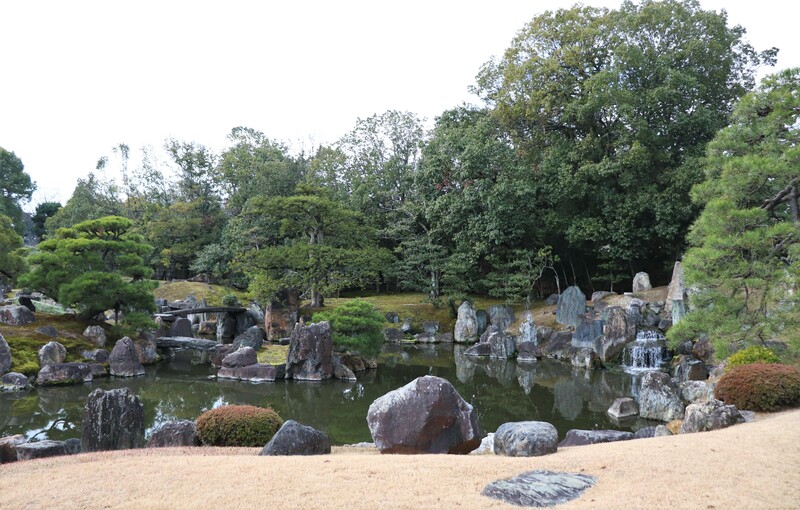 After Kara-mon Gate, you will see Japanese National Treasure, Ninomaru-goten Palace. There are many castles in Japan, but there are only a few castles with an intact palace on the castle grounds. 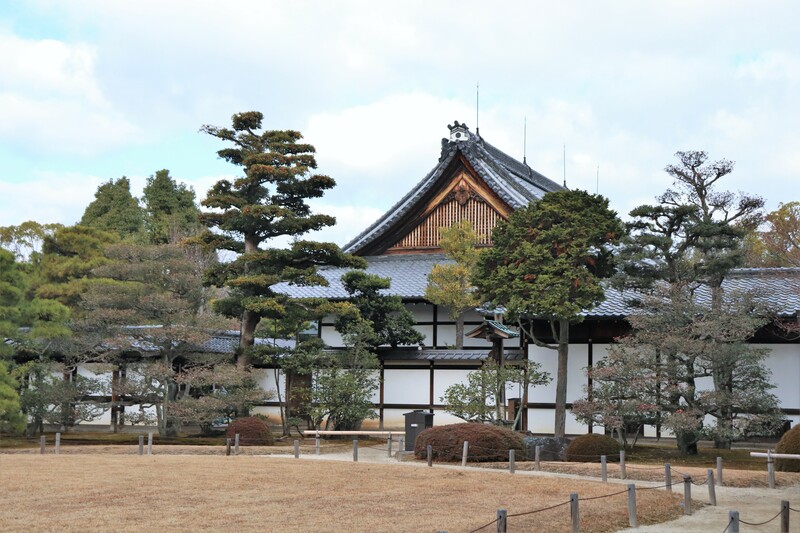 The palace is the epitome of Shoin-zukuri, the architecture style of wealthy samurai homes. 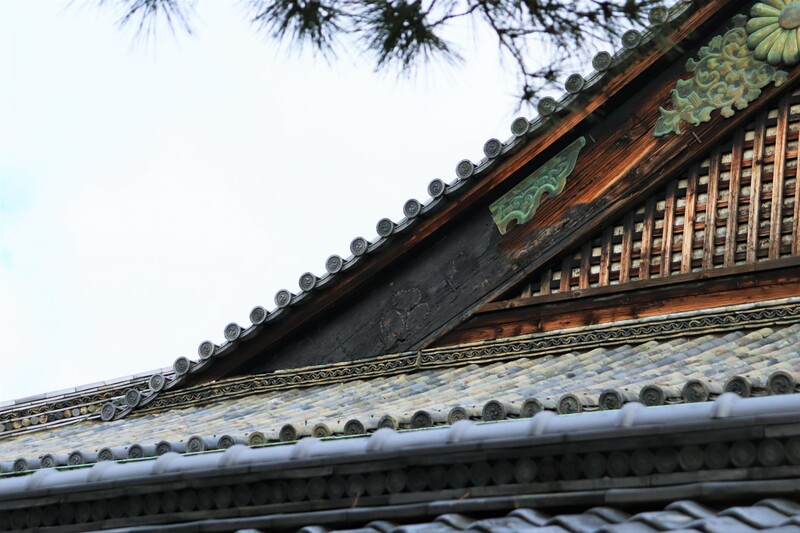 Each room in the palace has a distinctive purposes and Ninomaru-goten has as many as 33 rooms including the Shiro-shoin, Kuro-shoin and Ohiroma. 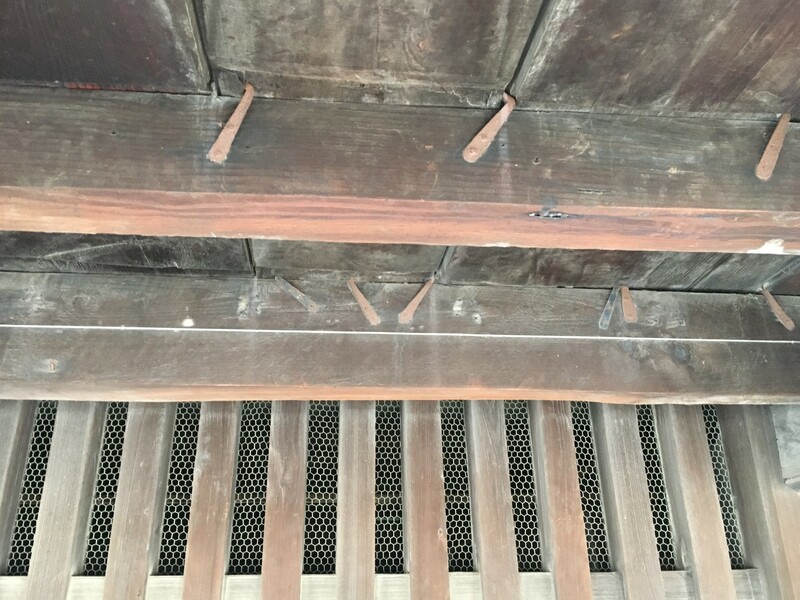 Underside of the nightingale floors of Nijo Castle. The iron nails are responsible for the tell-tale singing of the floors. Another interesting point about the architecture of Ninomaru-goten is that building “sings”. The floors of the palace are called nightingale floors, which creak, or “sing” when any weight is put on them– a measure that had it challenging to sneak up and assassinate someone. Unfortunately, photography is not allowed inside the palace. The main thing you should pay attention to are the wall paintings (even though all of them are replicas). Most of those paintings were originally painted by the famous wall painting artist, Kano Tanyu of the Kano school. Each of the paintings in each room serve a separate purpose. Among others, I think I like the golden Matsutaka-zu and Chikurin-gunko-zu especially you can see the unique faces of the animals. 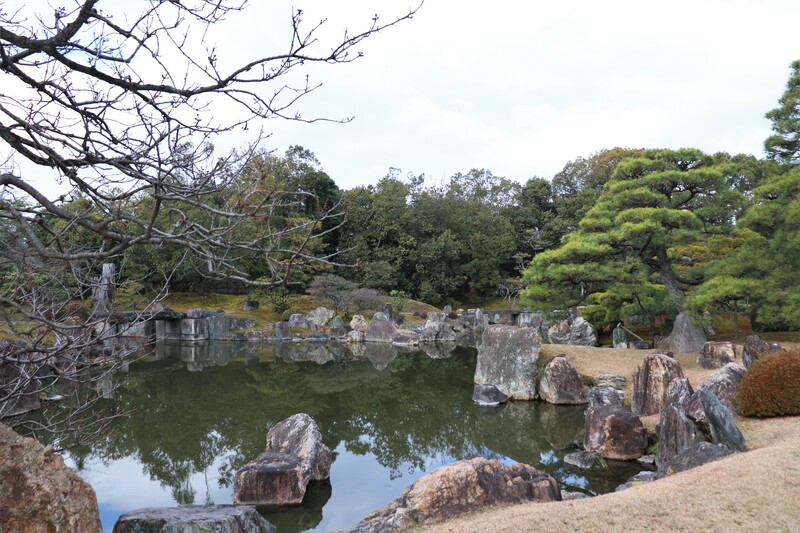 After walking through Ninomaru-goten Palace take a walk around Ninomaru Garden. The placement of the rocks throughout the garden allow the garden to have a slightly different view depending on where you see the garden from. In the winter the cycad trees are covered by straw in order to protect them from the cold. 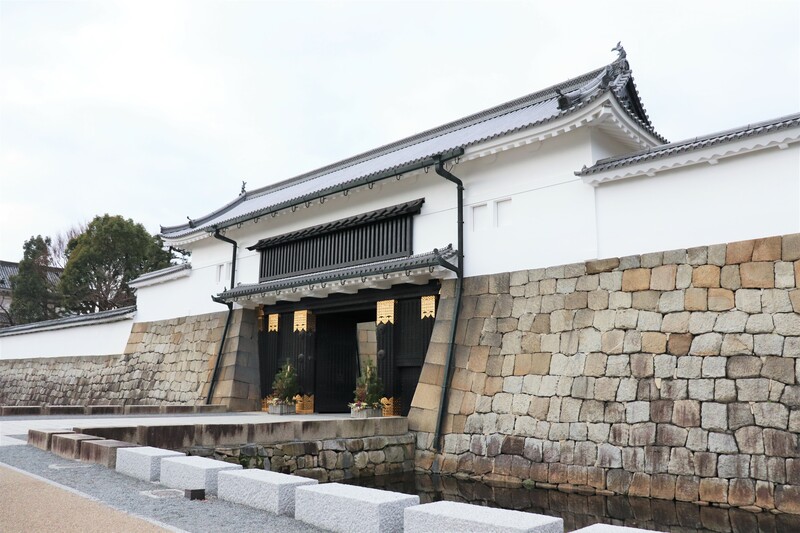 After visiting Ninomaru-goten Palace, make sure to visit Honmaru-goten palace too! Honmaru-goten palace was added later by the third Shogun, Tokugawa Ieamitsu, but unfortunately, it completely burned down in a city fire in 1788. Honmaru-goten is the former house for imperial family moved from the Kyoto imperial palace. The palace looks quite different from Ninomaru-goten palace. 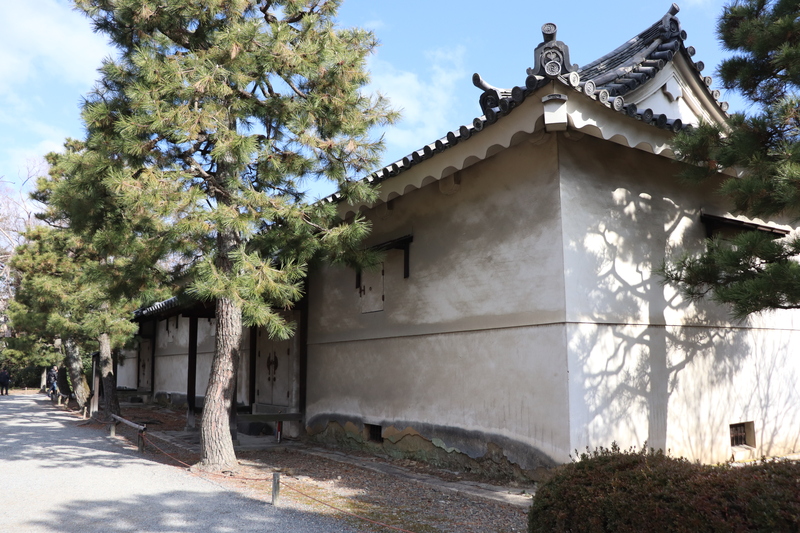 Honmaru-goten Palace: it looks like just an ordinary house. Currently under reconstruction and will reopen to the public eventually. Near Honmaru-goten is the former base of the keep’s tower. Sadly, when lightening struck the main keep in 1750, the keep burned to the ground and never got rebuilt. Former castle keep of Nijo Castle. Former site of the keep. Maybe the main keep was not that big. 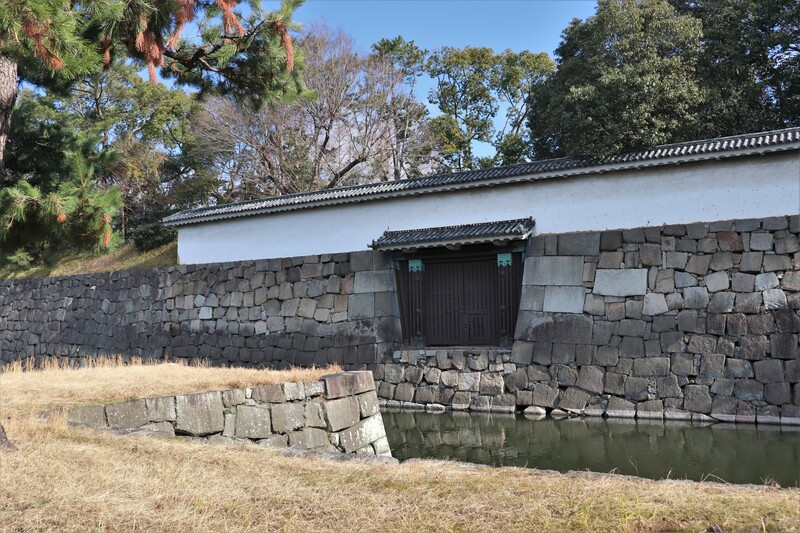 Just outside of Honmaru-goten Palace is an original rice storage dating back to 1625. If you want to see some of the original painting from Ninomaru-goten Palace, drop by Nijo Castle Painting Gallery. Though you can enjoy the wall paintings in Ninomaru-goten palace, many of them are far away and sometimes it’shard to see the details. In the gallery, however, you can see the actual wall paintings for only 100 yen. It is small museum, so they only show some of the painting and often rotate the collection, but I think it is worth it. If anything, next to the gallery is a gift shop that has some pretty tasty snacks. 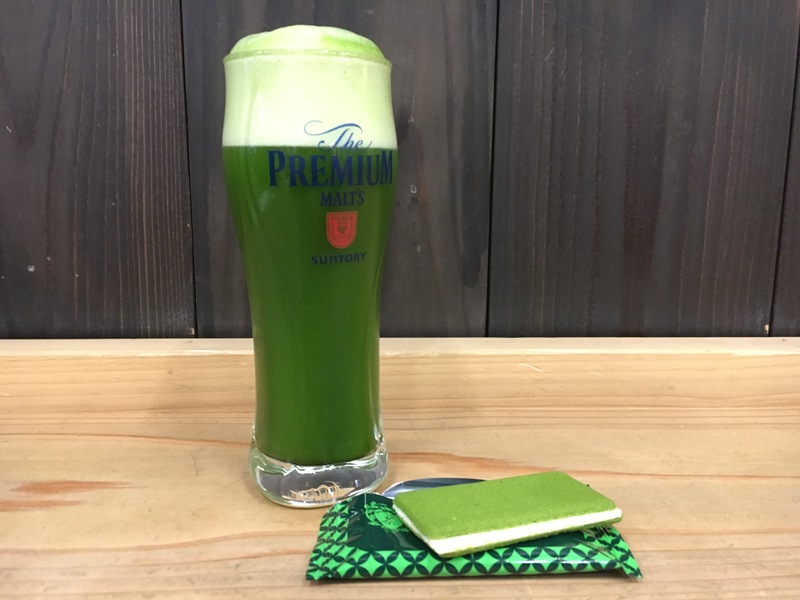 Even matcha beer! Matcha Beer!! Not that I didn’t see this coming, but unexpected all the same. Off to meet the fire god. Hiking Mt. Atago! The Suntory kyoto Beer Factory: Free Tour and Beer Tasting!